I love roasting anything, and I have the filthy oven to prove it! Everything I make in my oven is usually roasted, which means the temperature is always up at a high heat, usually over 400 degrees & the damn smoke alarm goes off daily. 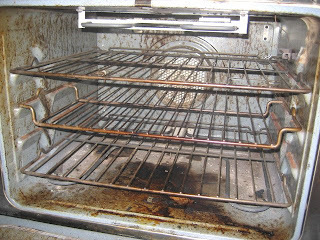 (if I would clean the oven once in a while, that would solve the smoke alarm problem). Roasting foods at high heat keeps everything crisp on the outside and moist on the inside. Especially vegetables. Roasting veggies tends to bring out their sweetness. Just sprinkle with some kosher salt and toss w/ some good extra virgin olive oil (I am addicted to Frantoia from Italy). Tonight, I made a great, easy pasta, that I swear, I could eat every week. In a shallow roasting pan, place 1 lb. whole cherry tomatoes in the bottom. Pour 4 tbsp. of olive oil, 2 tbsp. balsamic vinegar & 1 tbsp. of kosher salt or sea salt over the tomatoes. Roast at 475 for about 15-20 min. until they start blistering and are splitting. 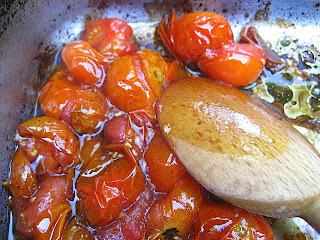 Remove from oven & set roasting pan w/ tomatoes aside. Cook about half lb. of penne pasta (or whatever shape you like), and when pasta is done, toss in the same pan w/ the tomatoes. Add 1/4 c. chopped kalamata olives and 1/2 c. fresh, chopped basil to the pan. Toss all together, this will make a light sauce with the juice from the tomatoes and the oil and vinegar. It is best served right away. 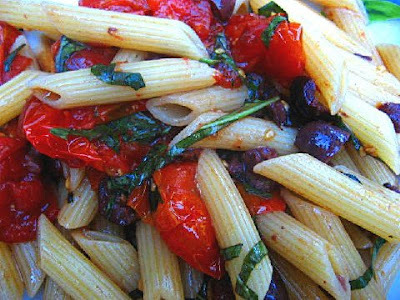 This is the most amazing pasta dish you'll ever have. Everyone enjoyed it and asked for seconds. I'm going to make it for a family party next weekend.